Someone to quickly rewrite an article/articles on me must be quick and responsive! I'm looking to hire a writer that can quickly rewrite articles for me. I'll send you the article/articles and you must rewrite them for me. The articles will be around 500 words each but sometimes more up to 1000. We'll pay around $5 for it for your time which is about the going rate these days? We're looking for a good, creative, responsive, punctual and professional writer. You have to have good to great writing skills in the English language. You have to be quick and responsive and do the article within 24 hours if you can! Ideally we want these done in 24 hours from giving you the order. Obviously if we give you lots of orders, we understand it'll take a bit more time. As long as you can do these within 24 hours and you meet the above criteria you're hired for life! Please note: all content will be checked before accepting. We look for uniqueness (must pass CopyScape). And must still make full sense in every sentence. While still using the important key words. Also, if you are a very talented writer and can work quickly, we will look at upping and increasing the rate we pay per article as well. Plus we may have other writing work opportunities for you too as we have a demand for all sorts of content from articles to transcribing, pres releases, documents, presentations, landing pages, blog guest post writing, video descriptions and more. 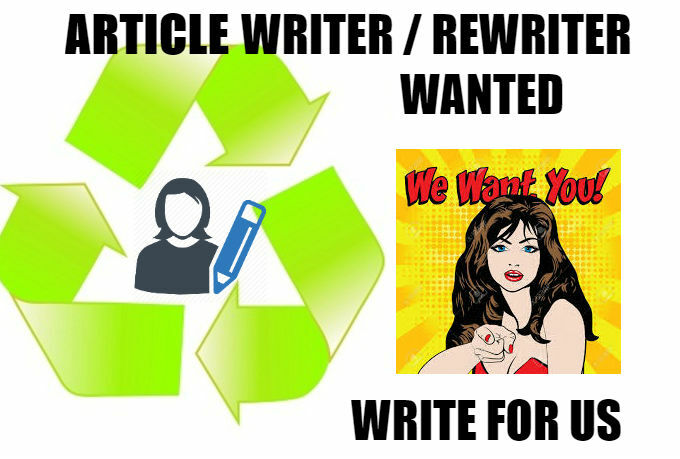 Required: An excellent, quick and efficient and punctual writer/rewriter to rewrite articles within 12-24 hours. Pay rate: Currently $5 during trial period. With a view to increased rates later on under your excellency. Someone to rewrite articles for us really quickly! Must be an excellent English speaking writer. Must be very quick about it and always do a great job! Must be able to take on multiple orders at once. If you meet these requirements do place a bid. Be sure to select "Allow Multiples" when you do. Please leave your writing skills, experience etc when placing your bid. We'll let all levels bid on this as we believe there are many diamonds in the rough and everyone deserves a chance! Cheers and I look forward to finding and hiring someone/you! And a happy and long and prosperous partnership and all of that! i can help you with the rewriting of your articles. the time is still an issue but i will be figuring out something for it. the quality is the first concern. of course i have a new account here but i have experience in writing blogs, content for marketing, seo and other purposes. i have been writing for some time now and i love doing it. re-writing your articles for you is no problem, and i assure you quality is my watchword. my articles pass copyscape and i deliver meaningful content. i do not spin articles. my bill is $10 for the 500-word articles and $15 per article for 1000-word. i will rewrite one article of 500 words on any topic as per need. i can provide 500 words unique articles.if you need 1000 words content and 2000 words content 20$. i can provide all contents blog posts, articles. inbox me. i am eager to work on rewriting articles as per your requirements. although, i am new to seoclerks.com, i have ten plus years of work experience in the real world in india. i am not looking at this as a one-time order; and i expect to deliver as per your expectations, hoping to start a long symbiotic professional relationship! i have gone through your requirements and it matches my interest too. i have been writing articles since last 4 years though i am new here. i can assure you that my article will be 100% unique and will not be boring that is it will grab the attention of the reader. talking about the quality of writing, it will not let you down. anyway, i just saw your ad- (someone to quickly rewrite an article/articles on me must be quick and responsive!) and i like to work for you and be your writer. as i already worked for you, so i hope you know my writing style. i learn lots from you, and this time the opportunity is higher. i am a professional writer and i will rephrase your articles with in required time plus i guarantee you that you will not find any plagiarism or punctuation mistakes. hi idealmike, thanks for this cool request. quick article/articles writing and rewriting in 24 hours or less. ~ great writing skills in the english language. ~ on time delivery and customer satifaction. i would be perfect for this job. i can produce the articles you need in under 24 hours to a professional standard. i have a ba in english and currently work as a social media manager for a small company. i'd be greatful for the opportunity. hi! this is faizan abbasi the intelligent, honest, hard worker, professinol guy. if youseeing a professional, hard worker, honest person so you seeing a right person. hi, i'll manually write a 500-word organic article for only $5. i write the articles in the conversational style. the articles would be 100% organic, 100% hand-written no spinning tools, passing grammarly plagiarism checker, grammatically correct, comprehensive, and of course, readable. i have been working on article writing since last 5 to 6 years and willing to do some work with you.i am professional and know all the rules to write article.i follow readability and easy writing to understand in reading.i am sending you my sample for further actions.hope to hear pmb from your side. i have been typing for the last ten years and by now i am good at . to add to that, i have a degree in bachelor in literature and this means your work will have no grammatical errors. hey, i am rody. i am a professional writer and rewriter. i've proper knowlage of almost all niches. i guarantee: a supreme quality work, distinctive selected vocabularies, 100% manual rewriting and committing to your deadlines. i read your post carefully and i want to work with you.i,m off page seo expert and hard worker.i am a good experience for article.i hope i,ll give u 100% satisfaction & 100% quality guaranteed. please give me the project..
hope you will see your best result..
i am considering your job for me with confidently as a article writer and publisher. you can order me now and enjoy the successful service.